The only good thing is that is inside the airport. We stayed here for connivence only and it certainly beat sleeping on the airport floor, but that's about all you can say. The location is great (don't have to leave the airport) although it proved very difficult to find in a big airport - not well signed at all. The bathrooms are cleaned after every use so that was lovely. Probably nothing. The fact that it is inside the airport is nice, but it’s terribly difficult to find jt. Nice location. Inside of airport. It is quite good for the passagers to sleep during airplant connections. Clean room, clean bathroom, wi fi available. Perfect to take some rest or sleep a couple of hours between long conexions. Very clean. A good place to stay when you have a long connection in the airport. They have good showers too. The shower/toilet space is incredible, and the room is just what you need to relax if you have a long stopover as I did. The preparation of rooms and the cleanliness of bathrooms. The property is so clean and comfortable, exactly what my family needed for our 10hr transit. Excellent location, excellent bathroom. Beds comfortable. FAST SLEEP Guarulhos by Slaviero Hotéis is conveniently located inside Guarulhos International Airport, in Terminal 2, Wing D National Arrival, East side. The hotel offers practical rooms with approximately 13 ft² in size and fitted with bunk beds. The small rooms at FAST SLEEP Guarulhos by Slaviero Hotéis feature air conditioning, telephone and free internet connection. Guests are also provided with a shared bathroom located outside the room (bathrooms are cleaned each time they are used). When would you like to stay at FAST SLEEP Guarulhos by Slaviero Hotéis? This air-conditioned room features a TV, telephone and shared bathroom facilities. This room only accommodates a maximum of 2 adults. The shared bathroom is located outside the guest room and is cleaned each time it is used. House Rules FAST SLEEP Guarulhos by Slaviero Hotéis takes special requests – add in the next step! 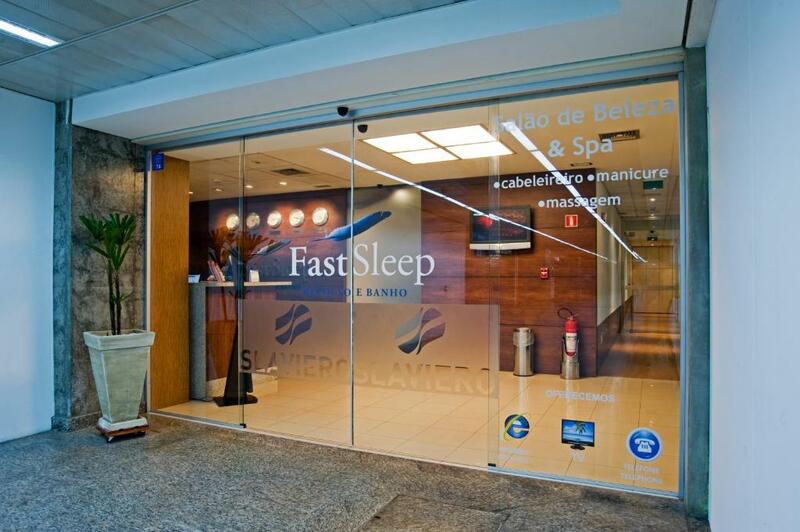 FAST SLEEP Guarulhos by Slaviero Hotéis accepts these cards and reserves the right to temporarily hold an amount prior to arrival. This hotel is located inside an airport, in Terminal 2, Wing D, next to the east domestic landing on the ground floor. A guest is allowed to stay only 1 night. Please inform FAST SLEEP Guarulhos by Slaviero Hotéis of your expected arrival time in advance. You can use the Special Requests box when booking, or contact the property directly using the contact details in your confirmation. Absolutely noisy, it’s impossible to sleep there. The bathroom to use the shower always had lines, it was seriously not worthy. It’s incredibly expensive for what you get. You essentially get a wardrobe for your room with a bunk bed in it. We paid £50 for that should really be paying £20 maximum. Great location it’s in the airport so you don’t have far to go for your flight. Noise during the night. People were coming in and out, checking in during the night and walking next to our door. That was disturbing. Location directly in the terminal. Tiny room, cold room with bad wifi. The convenience and cleaningness of the place. Cleaners all around all the time to keep the fascilites clean. Kind of expensive for what you get for a night. The staff, especially the girl that checked me in, was super friendly and helpful. She made me feel very welcome not only in the hotel but in the country as well. I forgot her name, but hospitality is in her blood. Excellent! Showers and toilets are cleaned after every use. Shampoo, soap and towels are provided for. The shower is nice, good pressure and easy to adjust temperature. There is a hairdryer as well if you need. Room is tiny but has all one needs. Tv works like a charm and there are 220V sockets to charge your devices. Excellent Wifi signal and speed. When I arrived at the hotel at midnight, they claimed not to have my booking. They were not able, willing or ready to make sure they find my booking if I tell them I have one - with confirmation number and everything. It took me hours and and many calls for them to finally understand that I do have a booking with them. I would highly recommend to avoid this hotel. They deserve the price for most customer unfriendly hotel ever. Apparently their internal processes are so bad that they are unable to process bookings! Unbelievable! I can't really say what I liked about this hotel as the experience was so bad that it overshadows absolutely everything. The rooms are too small and all the noise are heard. They allowed a baby near my room so I can’t sleep well. I can also hear the voices of people talking outside . The place is noisy and it was hard to sleep sometimes since I could hear people quite loud through the walls. The location is excellent when arriving during the night and there's a long lay over for a domestic flight.